A Disorder Peculiar to the Country started out full of promise until it fizzled out halfway and became too forced until the very end. This is a story of Marshall and Joyce Harriman, two people on the brink of a nasty divorce. Each of them thought the other was killed in the 9/11 attacks and both were gravely disappointed when it turned out they’re both alive. 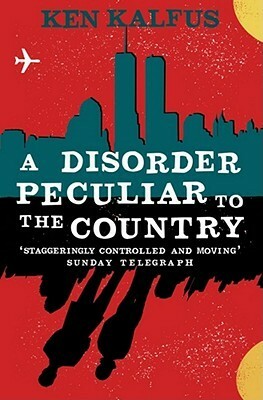 The 9/11 tragedy and its immediate aftermath became the backdrop of this tale about a marriage that started crumbling down years before; there’s so much hate that had it happened in the midst of a different, less catastrophic event, or even with no terrible tragedy at all, it would have been a nasty turn of events between the two of them, regardless. If you isolate each of our betrayals and self-indulgences, the mean things we’ve said to each other, the errors in judgment — on their own, they’re quite heinous. Yet neither of us did anything to the other that wasn’t in the context of something else. Anyway, the story went on relating the events post-9/11 to the Harrimans’ divorce progress. Saddam was executed, a fictional account of bin Laden getting captured happened (this was published in 2006; on the Harrimans’ front, the divorce was finalized, and each started moving on, slowly but gracefully. There are certain parts which I thought should have been fleshed out more thoroughly — I particularly liked the instances where both Marshall and Joyce allowed themselves to let go and spiral down into emotional wreckage by doing things they wouldn’t normally do, then realize just in time they weren’t cut out to be it, or to do it, after all. Thing is, it was scattered in different pages and weren’t tied together. They would have made the characters more worthy of sympathy because really, a marriage who ran its course, hatred flying all over the place, threats of terrorism and bio-chemical warfare, financial meltdown…what’s not to feel bad about? However, as I said, it didn’t happen. Instead, toward the end, it was tied together in a sloppy ribbon to create a more hopeful ending. It felt very contrived. Oh, well.